"The Terrace" is a spacious modern house on a terrace beside the Selwyn River. Unbeatable views over fields and the majestic Canterbury foothills. Double glazing and log fire keep you cosy in winter but in sunshine you'll want to dine outside or just snooze on the sheltered swing seat. When evening arrives, watch the sunset glow behind the hills then be awed by the quiet serenity of the countryside and the absolute clarity of the stars. Ideal base for skiing or exploring inland Canterbury. Also convenient for golf, fishing, hiking, cycling and tennis. Kids can build dams in the river, climb trees, use the play area in the old school grounds next door, or walk 5 mins to the local playground. SKIING: Just 35 mins to either Mt Hutt or Porters Heights skifield turnoff. GOLF: 5 mins to Glentunnel golfcourse or 15 mins to Terrace Downs resort. RAKAIA RIVER: 15 mins (walkway, jetboating and salmon fishing). GROCERIES: 5 mins to the Glentunnel store or 10 mins to shops and cafes in Darfield. 2 bathrooms, electric blankets, heated towel rails. Modern, well equipped kitchen with dishwasher, microwave, breadmaker, coffee plunger, wine glasses, thermoses, etc. Family gear includes highchair, baby bath, toys, bikes, tennis rackets, pole tennis, petanque, toboggan, board games, DVDs. Beds for 6. Portacot, 2 fold up beds and spare bedding also available. Twin beds can be converted to a king. All linen, cleaning equipment, soap and basic pantry supplies provided. Just bring your own ground coffee and food or replace what you use. “This would have to be the nicest holiday home we have ever stayed in"
"Gorgeous house, in an ideal spot for skiing Mt Hutt"
"Immaculate property in a beautiful, peaceful location"
"What an absolute "find" ". Infants under 2 yrs free if not using a bed. 10% deposit on confirmation, balance 7 days before commencement of stay unless by prior arrangement. House to be left clean and tidy for next tenants, with beds remade, but washing not required. NOTE: Cleaning opt-out available for $100. Longer term tenancy can be arranged - e.g. for work purposes. If adjacent bookings are received you may be asked to vacate by midday. $120 for 1 or 2 adults/night, additional adults and children $25 each/night. Under 2yrs (if in portacot) no charge. NOTE: Under Kiwi bach tradition you are expected to: Clean the house and do the dishes before you leave. Fully equipped with everything you need in the kitchen, or for children's entertainment or for baby needs. Beds to be remade before departure, using clean linen provided. Basic supplies for use; tea, coffee etc. Some pantry items available but please replace if used. Equipped for 8 guests plus extras. Breakfast bar with seating for 2. Sky dish fitted, bring your own decoder. Collection of DVDs available for use. Books for reading during guests' visit; not to be removed from the property. Indoors games (eg board games, puzzles etc), outdoor play equipment. Suitable for children, may need attention. eg tyres pumped up. Body boards (for use on the river). Tennis courts at Glentunnel, 3 km away. Golf Course at Glentunnel (Hororata Golf Club), 3km away; Terrace Downs 30km away. Close to major skifields; 30 min to Mt Hutt, Porter Heights. Less than 1 hour to other Canterbury skifields. 50 min to Castle Hill village. 85 min to Arthurs Pass. 50 min to Central Christchurch. This house is very well set up and such a peaceful location. The views and outdoor areas were just great. 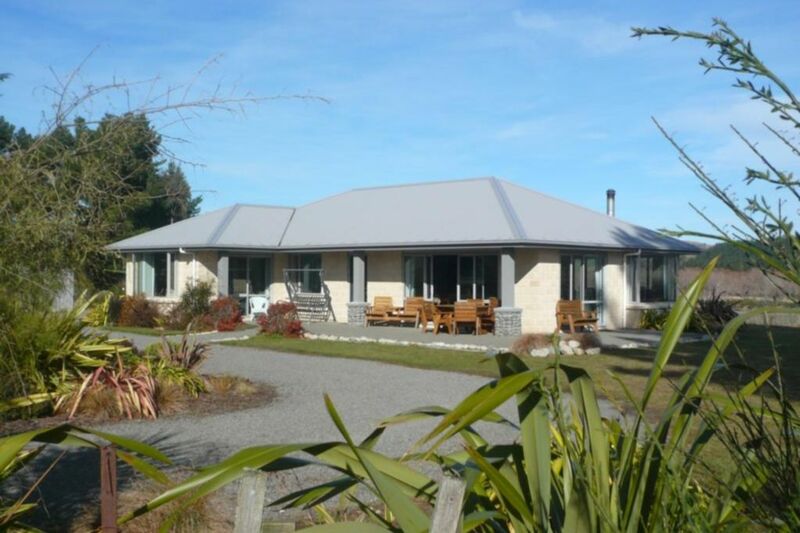 Ideal location to explore the foothills of Canterbury or just relax looking at the views. Thank you Gary. We really appreciate the spotless condition you left the property in on your departure and we are very happy to refund the cleaning fee as a result. We will look forward to your return visit! Thank you; we are glad you found everything to your liking and you enjoyed your stay in our property. However we were very disappointed that the house was not left in the same condition that you found it on arrival, and that the requirements to leave the house clean and tidy and with all beds re-made were not met. A ckeaning fee has been requested, as a result. Great house in a great spot. Sure we will be back again for the third time. Loved this home - super comfortable and well organised. Loved this home - super comfortable and well organised. Felt like a home away from home. Would definitely recommend to others wanting perfect ski accommodation for Mt Hutt. Excellent facilities - warm, comfortable, well equipped and organised. Thanks! lovely clean big house and outdoor area really liked our stay here will be coming back thats for sure.